Collectible Isn’t All It’s Cracked Up to Be! These past few months being (virtually) around the gals at Gauche Alchemy have really done a number on my creativity. In the best possible sense of that sentiment! It’s true, when you surround yourself with creativity in any form–be it people or resources–and are open to it, your own creativity blossoms and blooms all over the place. Which is why, a little over a month ago, when I heard about the high school student who made her prom dress out of cardboard, I got the idea to challenge the other members of the Gauche Alchemy Design Team (known as Alchemists) to create our own outfits out of supplies from the Gauche Alchemy store. These didn’t have to be life-size outfits, we settled on dolls for this project, and established a limit of no more than 10% fabric in our creations. For my doll, I had this “collectible” Bradley doll of Polly Flinders that I got as a young girl. For spoiling her pretty new clothes. After many, many moves and a decade or so spent in storage in one garage or another, she was looking a little worse for wear, so I didn’t have much compunction in remaking her as an art doll. I realize Styrofoam doesn’t easily break down in landfills, but it doesn’t exactly scream collectible to me. When I removed the costume that was pretty much all I found: Styrofoam, glue and a metal armature for the arms. We can do better than that! Originally I’d planned to make her over as a steampunk dolly, making use of Ouchless Cardboard and lots of aged elements. But I really loved the idea of using this pink-heart punchinella as tights, just for the pop of color. But the pink just wasn’t meshing with the original costume idea and I was debating what else to do when I decided, first, I needed to address the great big crack in her midsection. Filling it with glue helped, but she needed a bit more, so I grabbed some washi tape (a new love) and ended up giving her a pink and black gingham mini-dress in the process. Steampunk was officially out of the picture, the punchinella tights were in, and suddenly Polly became a circus performer! 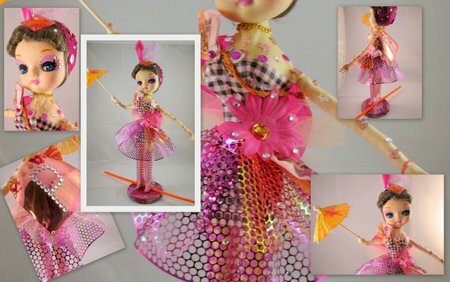 In addition to more punchinella for the tutu (in both pink and orange), pretty much everything in her outfit came from the Pink Parts and Lady Marmalade Orange Mixed Media Color KitsÂ in the Gauche Alchemy store. I added a few things, like the feather in her hair, and a package of little rhinestones that I applied using my new-found knowledge from watching many episodes of My Big Fat Gypsy Wedding. Her shoes got updated with some leftover paint testers (not from GA, but totally in the spirit of the group) and some pink bows I found in my stash, and her boring wooden base got covered in bits of punchinella, covered in 3 colors of tissue paper and then sealed with Mod Podge. She even has a orange tightrope to walk. You can see the runway presentation over on the GA Blog and check out the rest of the awesome dolls my teammates (and new friends!) created. They are all spectacular–is it any wonder I’ve been feeling the creativity surge, lately? We’ll be getting back to the 64 Arts next week, but don’t be surprise if more random projects pop in and out of the Tuesday posts for the foreseeable future 🙂 After all, exploring the 64 Arts is all about expanding your creativity (and my own), so it only seems natural to deviate from the list from time to time! 2 Link-ups in a row?! Yup! This was such a great challenge and your doll is awesome! I love the punchinella tights!